Hollister, CA- The Dual Tour saddle is the most generously sculpted seating on two wheels! This model is designed specifically for the HD Touring bikes that have the new (2014) Tour Pak design from The MoCo. 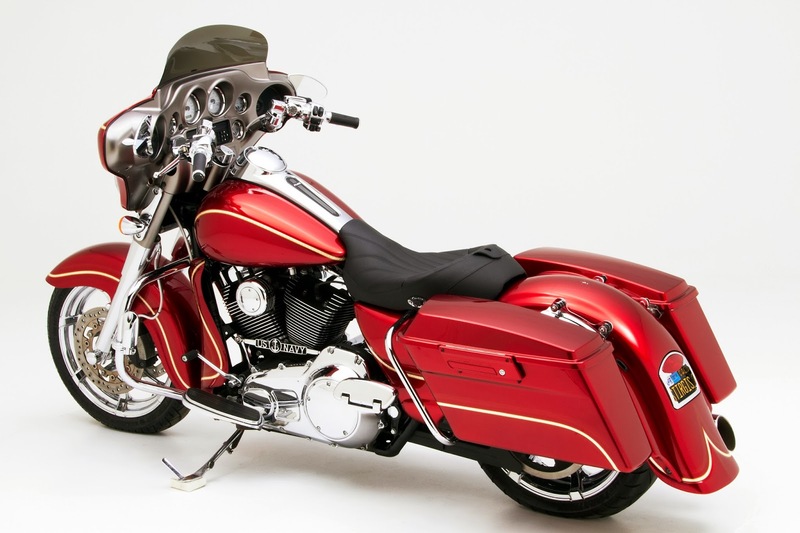 In other words, it fits your Electra Glide Ultra Classic, Ultra Limited or the CVO Limited models. If you put the new Tour Pak on your 2014 Street Glide then this would be the way to roll for that also. Wide, sculpted seating positions create a larger area of contact for excellent weight distribution. Shaped like your body to eliminate pressure points and give long lasting support that will keep you in the saddle all day. The all new, lower chassis of Harley's new Baggers gave us additional design latitude for developing a perfected shape and good ground reach. Wide, sculpted seating position creates a larger area of contact for excellent weight distribution. Shaped like your body to eliminate pressure points and give long lasting support that will keep you in the saddle all day. Also available in a Close version that provides seating two inches closer to the bars with a narrower nose to ease ground reach. that's Corbin's Classic Solo saddle! 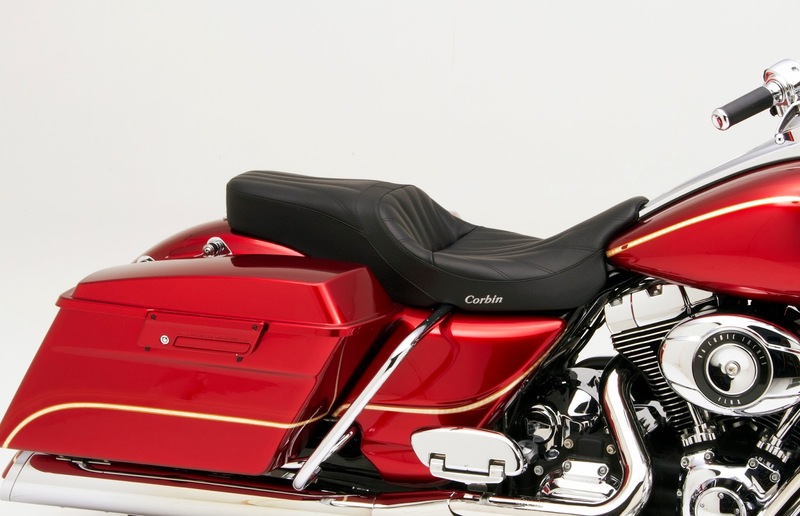 Gambler saddle offers a sleek, flowing appearance and low profile design that has made this design extremely popular for 'round town cruising. 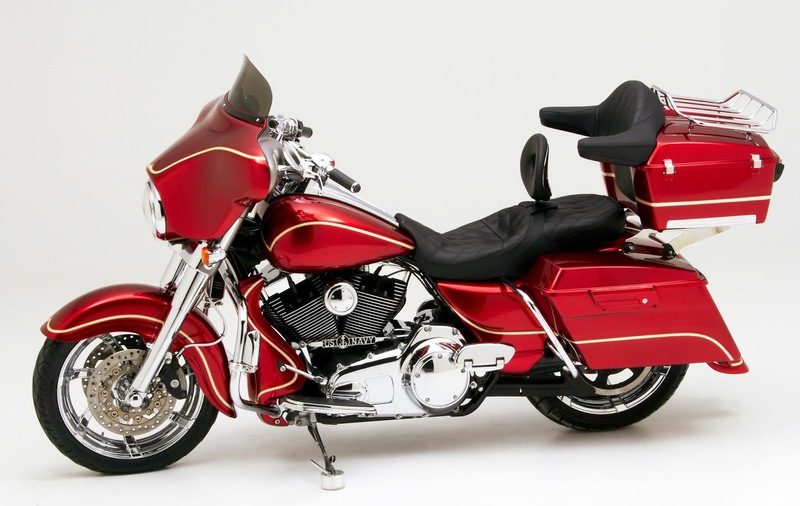 Gambler features a comfortable driver's position with a clean pillion seating area providing a flawless profile. Built-up of Comfort Cell® foam that allows a low saddle that retains comfort value. Sculpted seating disperses rider's weight ergonomically and gives you lasting support while still providing good ground reach at stop signs! This is a good choice for riders that often ride solo or have passengers along for short to medium trips. At the Verona Motor Bike Expo in Italy, one of the biggest and best Custom Bike Shows in Europe, we had a brief moment to to talk to Max, owner, builder and painter of the World famous MS Artrix Bikes. Long, low and graciously formed Custom Bikes that won many prizes and awards in Italy and Europe, decorate his stand. Max, dressed in typical Italian style, does not represent the Biker-look, he looks more like a designer and that’s exactly what he is. Max started designing and custom painting Bikes in 1995. But painting alone wasn’t enough for Max, who realized that he wanted to be more involved in the whole bike building experience. “It was a long process, but after many years, in which I learneda lot, I started building one-off Custom Bikes. That was in 2006, when I built my First custom for a client.” It was an instant succes story. Magazines spread the word and showed his pieces of rolling art, his bikes attended various bike shows and MS Artrix became a succesfull and famous builder. Max, who used to be working in Construction, builds unique, one of a kind and one-off bikes, still does the painting all by himself too and the owner of World Famous fashion company Fendi, with a keen eye for fashion and perfection, commissioned a motorcycle at MS Artrix. Signore Fendi was so happy with that bike, that he recently ordered another one to be build at MS Artrix.